Lyle: Best known for playing a sunburst Les Paul in the now legendary rock band - Led Zeppelin, Jimmy Page has had a successful music career that now spans over four decades. Page began playing guitar around age 13. He was inspired by the Elvis Presley song "Baby, Let's Play House" (featuring Scotty Moore on guitar). He took a few lessons but wound up being self-taught. His first band was Neil & the Crusaders. He left the band early because of a bad flu. In the early '60s he ended up working as a very successful session guitarist in several studios playing on many recordings, in many styles of music every week. He later joined the Yardbirds in '66 and played with Jeff Beck in the group. After Beck left, Jimmy took over the lead guitar spot until the band broke up in '68. Page put together a rock band called the "New Yardbirds" with players John Bonham, John Paul Jones and Robert Plant. Lyle: Keith Moon from The Who told Page his band would go over like a lead balloon, which is how the new name for the group came about - Led Zeppelin. (ZEPPELIN was the name given to the duralumin-internal-framed dirigibles, like our current day Goodyear blimps, invented by Count Ferdinand von Zeppelin. The Zeppelins were used in both war and peace). Lyle: One of the things that really impressed me about Page is that he was the main guy responsible for the band Led Zeppelin. He conceived the band, the sound he wanted to get no matter what style of music, located just the right musicians for the band and hired them, wrote the music, recorded them with the help of studio engineers, and produced all of their albums. Page uses Marshall amps for studio as well as stage. But for many of his recordings he used a small Supro amp. Example: The solo in Stairway To Heaven was a Fender Tele plugged into the small Supro amp. He used Les Pauls, Stratocasters and Telecaster guitars for most of the recordings. Suggested listening: Page never limited the band to one style of music. Listen to the jazzy "Since I've Been Loving You," or the middle-eastern "Kashmir," the bluesy "You Shook Me," the acoustic "Bron-Yr-Aur," straight up rockers "Rock and Roll" and "Whole Lotta Love," the reggae "D'yer Mak'er", the slow and beautifully orchestrated "The Rain Song" or perhaps the greatest song in rock history, Stairway To Heaven. All have a different style to them. If you listen closely to his guitar tones, you'll notice they are relatively clean, not much distortion. As a youth, I thought I needed to have a killer distortion sound to get that "Zeppelin" sound, but now I hear it differently, it's pretty clean for the most part. He uses different effects from time to time like flanging and phasing, reverb and delay. One of the most interesting effects on the Zeppelin recordings is Page's use of multi-tracking. He would layer the guitar parts, sometimes recording the same part several times to create the sound of a "guitar orchestra". Lyle: Page has often expressed interest in the teachings of English Occultist/Magician Aleister Crowley. He owns the second largest collection of Crowley's books in the world, and one of his three houses/mansions is Crowley's former residence at Boleskine on the shores of Loch Ness. Lyle: We'll take a look at the technique of layering guitar parts in this lesson, also his use of the major pentatonic scale. The first rhythm riff is based off the key of A. The interesting thing about the rhythm is that it's in 3/4 time, 3 beats per measure, but the drums are playing in 4/4 time. Lyle: Use the same jam track for rhythm riff 1 (looping sound clip 1) to play this solo over. Lyle: In the Page tradition, I recorded two rhythm tracks for rhythm riff 1 to make a bigger sound. When you listen back to the lesson sample, an electric clean tone guitar is coming out of one speaker, and an acoustic guitar is coming out of the other speaker, both playing rhythm riff 1 at the same time. The tone I'm using for the lead guitar is the bridge pickup, a mild overdrive setting on the amp, and a fast chorus effect. Lyle: Let's move on the 2nd section of the lesson sample. 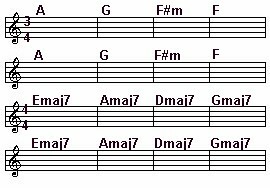 This is based of major chords again but starting in the key of E.
Lyle: Still the same electric and acoustic are both playing the chords at the same time which gives a fuller, richer sound. Notice you're using your thumb on the 3rd chord for the bass note. Lyle: The solo for this section of the lesson sample sounds like two guitars, but it's really just one playing two notes at a time. Before you start to work on the solo, I want you to become familiar with these major pentatonic scale patterns in 4 different keys. Why, because the solo changes key each time the chords change in rhythm riff 2. Wingless: Why are some of the notes circled? Lyle: Those are the root notes of the scale. Lyle: As you examine and learn the solo, notice that you're using the major pentatonics, following the chord progression. Lyle: Effects: Use a slight overdrive and a fast chorus effect. Lyle: Use the jam track for rhythm riff 2 (looping sound clip 2) to play both halves of the solo along to. Lyle: Page's guitar style is so broad that it's hard to show you everything in just this one lesson.